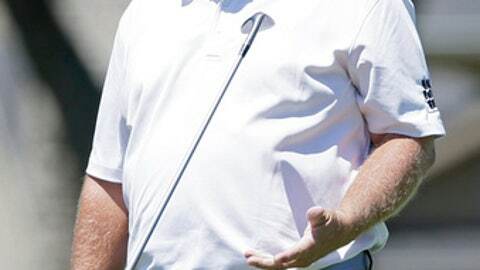 John Daly has thrown golf clubs during fits of frustration over the course of his wild career. He says his putter going into a lake at a PGA Tour Champions event last week was not one of them. Daly says reports of him throwing his putter into the lake at the Allianz Championship in Boca Raton, Florida, were lacking context. The two-time major champion said his sciatic nerve was acting up and he probably shouldn’t have played. He decided to withdraw after the seventh hole and while walking off the green, he flipped the putter over his shoulder to his caddie, who wasn’t watching, and the club went into the water. There was no video of the incident. A writer for www.linksmagazine.com posted a photo on Twitter of the top of Daly’s putter in the water as fans gathered around for a look. Daly said the thick, foam grip enabled it to float. He was more distraught at losing the putter, which he described as a 50-year anniversary model of the Ping Answer that company chairman John Solheim gave him. Daly said he called the head pro at The Old Course at Broken Sound to see if he could get it back, but by then someone had already retrieved it. Daly’s most recent club throw was at Whistling Straits at the 2015 PGA Championship, when he put three balls in the water on the par-3 seventh hole and after hitting the green on the fourth try, he slung his 6-iron into Lake Michigan. ”That was a proper throw,” he said. Daly finished 71st on the money list last year in his first season on the 50-and-older circuit. His best finish is a tie for 11th. Daly said he had his back worked on and he plans to play in the Chubb Classic this week in Naples, Florida.